DO-68458-51 was succesfully added to your cart. Flow capacity to 80 scfm! These Type 70 regulators are specifically designed for applications that require substantial flow capacity and accurate pressure controls. Downstream pressure can be set within 0.25" of water column and is accurately maintained under varying flow conditions with the help of an aspirator tube, which adjusts the air supply in accordance with the flow velocity. 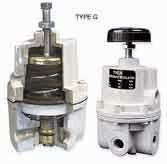 A balanced supply valve, using a rolling diaphragm, makes the regulator virtually immune to changes in supply pressure. Quality materials ensure long, trouble-free operation in the most difficult industrial environments. The precision die-cast aluminum housing is finished with vinyl paint, which resists scratching, weathering, and other physical wear. Regulators are pressure-tested and chrome-plated for corrosion resistance.